The Drive 61 navigator is loaded with helpful driver alerts, live services and up-to-date content so you can always drive with confidence. The future is on your Garmin. Just look ahead and drive. Wherever you're going, have a smoother trip with Garmin Drive. This dedicated GPS navigator includes innovative driver alerts to help increase your situational awareness and preloaded travel points of interest from TripAdvisor to help find everything you need along the way. The future is on your Garmin. Just look ahead and drive. What's more, your nagivator wirelessly pairs with any Garmin Connect-compatible smartwatch (sold separately). After they're paired, you can receive navigation right on your wrist after parking your vehicle and walking toward your destination. Also, Watch Link lets you receive helpful driver alerts on you watch, such as alerts for upcoming school zones and more. Don't worry about losing your car in a crowded parking lot or on a side street several blocks away from the venue you visited; your smartwatch provides compass guidance from your parked vehicle to your destination and back to your vehicle again. For a complete navigation solution, Garmin Drive pairs with the BC 30 Wireless Backup Camera (sold separately; professional installation recommended). 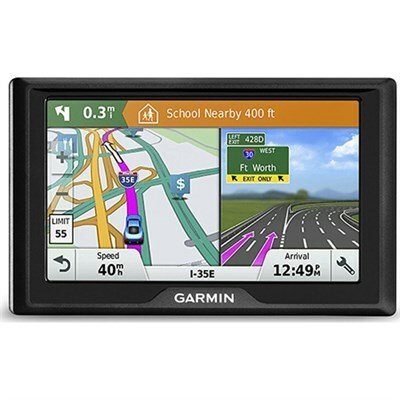 Once connected, you can easily see vehicles, pedestrians and other obstacles right on the Garmin Drive display as you move in reverse.